The New Bolsover ‘Model Village’ of the Bolsover Colliery Company was served by a tramway which ran from the colliery yard (SK 461709) It starts near to the workshops and brick yard kiln and drying sheds area and then southwards through the colliery yard and then under the road, Bolsover to Chesterfield Road (SK 461708) running parallel but a short distance away from the Doe Lea Branch of the Midland Railway. It passes what may be an earlier clay pit with sidings at (SK 362706) This may be where the night soil was offloaded. At (SK 462705) it turns to the south east and runs for a short distance and over the Midland Branch line via a bridge, (See photographs) where it branches off to a clay pit at (SK 463705). Clay from here and other areas in the locality were used by the company to produce bricks for use at the colliery and underground and possibly for the village repairs. The tramway then turned and ran southwards for a short distance to the north top row of the village and the stores where it split at (SK 464704) one line running southwards towards the school and the other eastwards between the top and bottom north rows running up the middle of the road, turning south at the top of the road and then west along the road, still following the centre of it, turning north at the bottom and running towards the school (SK 464703) and then past it to the school side of the road. (Not in the middle). It continued past the school to the split at (SK 464704). The tramway was a small utility railway drawn by a horse or pony, it could be used on site at the colliery for transport . It’s proximity to the brick kiln would have enabled it to be used for the movement of bricks for the colliery and possibly to build New Bolsover village. Passing as it did the clay pits, raw material could be moved to the colliery for use in the brickmaking process. There were two main uses of the tramway for the village people, primarily to remove the ‘night soil’ from the earth middens at each dwelling as the houses did not have sewers so human waste was removed regularly from them. There would have been a midden for each property on the yards. Secondly miners heating coal was delivered to the properties during the winter months, coal was not provided free all the time only during the cooler months of the winter. 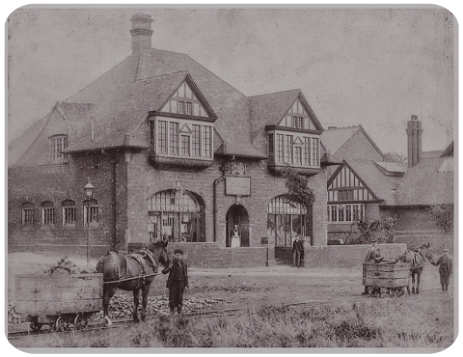 It may also have had another use to deliver provisions to the Cooperative or the Colliery Club from the railway, but it appears not to be directly connected to the station so this is only a guess. The photograph of the tub and pony was taken around (SK 464704) area looking north east between the two rows. Possibly from the bowling green area. The photograph looking towards the station was taken at around (SK 462705) looking north towards the colliery and station. 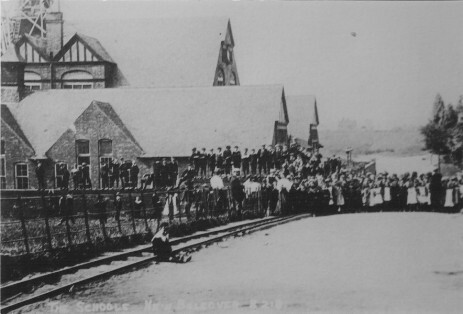 The photograph of the school was taken at about (SK 464703) looking north. Start at the colliery: SK 446159 370995. Passes under the road: SK 446182 370818. Old clay pit: SK 446195 370601. Bridge over railway: SK 446240 370513. Clay pit: SK 446321 370542. Turn to serve village: SK 446407 370426. Explore the map from NLS. (National Library of Scotland). Opens in a new window. 25 inches to the mile. 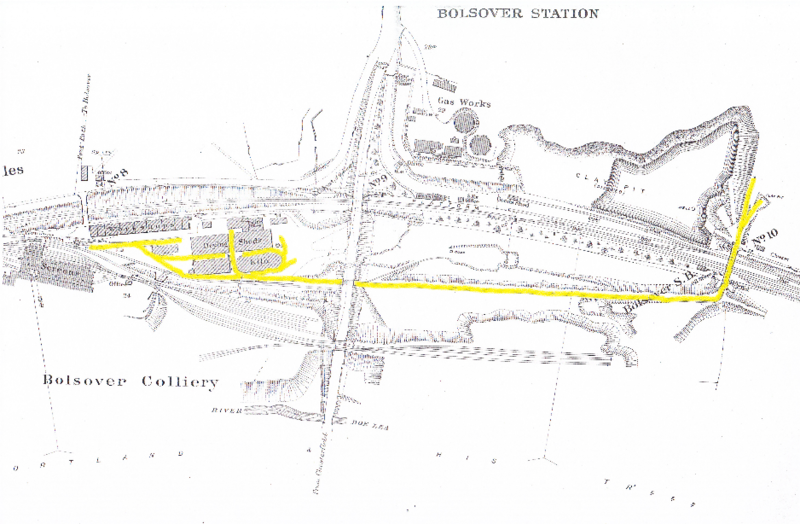 Bolsover Station & Colliery 2 Chain map. (Glynn Waite). Showing possibly possibly what is an earlier plan of the tramway to New Bolsover. Bolsover station from the New Bolsover Tramway Bridge. John Platts. The tramway bridge remains over the Midland Doe Lea Branch line. January 2017.